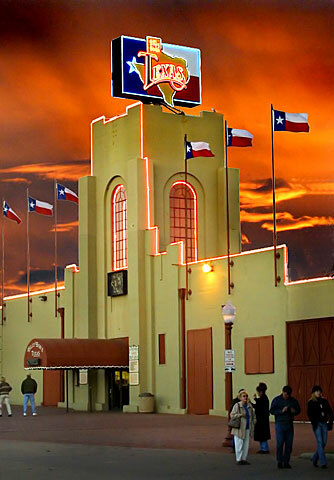 The Building now known as Billy Bob's Texas was built in 1910 and was once a large open-air barn for housing prize cattle during the Fort Worth Stock Show. In 1936, as a Texas Centennial Project, the building was enclosed by the City of Fort Worth at a cost of $183,500 and the tower added. The "new" structure contained 1257 animal stalls, and a 1200 seat auction ring that is now Billy Bob's Bull Riding arena. The floor of Billy Bob's slopes from the entry toward the showroom stage, making an ideal elevation for concert seating. With 127,000 square feet of space, which is nearly 3 acres inside and 20 acres of parking, for entertainment and events, Billy Bob's has 32 Max individual bar stations, country music's biggest stars, Live Pro Bull Riding and a Texas size dance floor for everyone to enjoy. It's no wonder that Billy Bob's Texas has been named Country Music Club of the Year 5 times by the Academy of Country Music and 2 times by the Country Music Association. We have also won the Country Music Association's Venue of the Year award! That's an incredible 8 times!